Head to Encinitas for a joyful jumpstart on herb-ing and tomato-ing up your yard. Head to Encinitas on March 17 and 18 for a joyful jumpstart on herb-ing and tomato-ing up your yard. SPRING PLANTING JUBILEE... & Tomato Sale on Saturday, March 17 and Sunday, March 18. 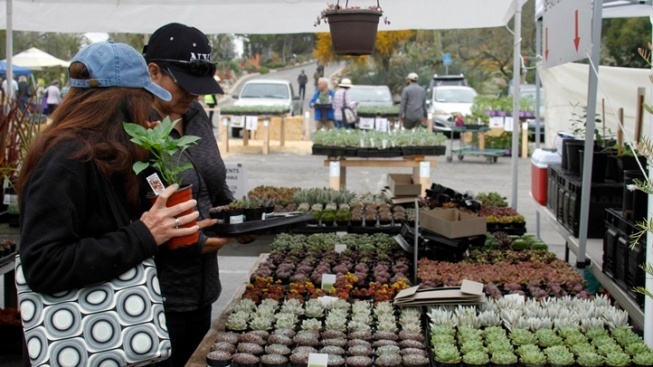 The "March planting madness" event is "a plant lover's dream," one that includes all sorts of goodies to take home and lovingly set in your own soil. Herbs? Oh yes, they'll be there, and bromeliads, too, and "locally sourced and grown summer garden vegetables" from Diane's Herbs. Workshops that are filled with know-how and can-do? They are part of the springful scene, you betcha. And to keep tummy complaints at bay, there shall be vittles to buy at Two for the Road, a food truck, as well as the Feel Good Coffee Cart. CHECK OUT ALL THAT'S SPROUTING... at this herb- and vege-focused wonderland, now, and what else the busy weekend will bring. And no worries, at all, if you didn't plan your rosemary and mint plots back in January. There's help coming up, in Encinitas, at one of the most basil-beautiful, thyme-tastic to-dos on the calendar.